We’d love your help. Let us know what’s wrong with this preview of Voyage to the Star Kingdom by Anne Riley. In the small community of Village-Upon-Stone, a storm settles solely over the house of a beloved family. Instead of leading their normal, happy life, the family—a father, a mother, and three young daughters—must battle fierce winds and torrential rain. The other villagers come to the family’s aid, but it’s no use against the rapidly rising waters. The family and their neig In the small community of Village-Upon-Stone, a storm settles solely over the house of a beloved family. Instead of leading their normal, happy life, the family—a father, a mother, and three young daughters—must battle fierce winds and torrential rain. The other villagers come to the family’s aid, but it’s no use against the rapidly rising waters. The family and their neighbors pray to the Star King for relief. They know he is good, but they have never endured such a storm; what if he does not send help? But he does, and after the family receives the Star King’s gifts, he sends an Angelfish to invite them to a grand banquet at the Radiant Palace. The family is thrilled, but the Star King has asked that the two youngest daughters travel to his kingdom first, with the rest of the family to follow afterwards. The family is alarmed by this request, but the Angelfish reminds them that the Star King does not always do things in the usual way, and they will be with their daughters again sooner than they think. They trust the Star King, so they send the daughters to his kingdom in a makeshift boat led by the Angelfish. On their voyage, the girls experience beauty, darkness, and fear, but eventually reach the Star Kingdom, which immediately feels like home—and the people who greet them there are the greatest surprises of all. 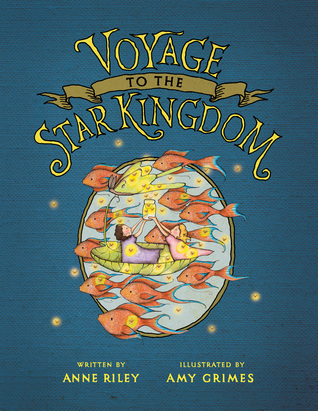 Inspired by a real-life family, Voyage to the Star Kingdom is a vivid reminder that our stories don’t end with death, and that the King is indeed making all things new. To ask other readers questions about Voyage to the Star Kingdom, please sign up. This book has been a sweet balm to our family, especially to me. It was on a booklist of "helping your family process grief." I am thankful we enjoyed and believed its sweet message before we needed it. A touching story on the difficult topic all of us must one day face; the loss of a loved one. Riley weaves a beautiful story that presents storms and troubles in an eternal perspective, and one that is easy to introduce to children. As with any story that starts with God, it ends leaving you feeling uplifted and comforted. I don't have children of my own yet, but I know that when I do "Voyage to the Star Kingdom " will secure a treasured place on my children's book shelves. I have already ordere A touching story on the difficult topic all of us must one day face; the loss of a loved one. Riley weaves a beautiful story that presents storms and troubles in an eternal perspective, and one that is easy to introduce to children. As with any story that starts with God, it ends leaving you feeling uplifted and comforted. I don't have children of my own yet, but I know that when I do "Voyage to the Star Kingdom " will secure a treasured place on my children's book shelves. I have already ordered a few extra copies to give to my nieces and nephews. Also, This book isn't just for children. It blessed me in a big way! I lost my brother a year ago and reading Voyage to the Star Kingdom reminded me that God is not bound by time. We will see each other again in paradise, and we will never be apart ever again. Such an amazing book and such a beautiful story behind the book. It shares the gospel and points you to Christ in such a beautiful way! It is really a must read! Beautiful. Narnian. Can barely make it through without weeping. Highly recommend for story AND whimsy illustrations. Anne Riley is an author of young adult fiction cleverly disguised as a high school Spanish teacher. She lives in Birmingham, Alabama, with her family. Anne began writing at the ripe old age of nine, when she penned a literary classic about… well, she doesn’t really remember what it was about, but she’s pretty sure the main characters were ferrets. These days, she writes stories about teenagers inste Anne Riley is an author of young adult fiction cleverly disguised as a high school Spanish teacher. She lives in Birmingham, Alabama, with her family.